If your pup loves visiting The Ranch for daycare, he or she will get more of a good thing when boarding with us! We are proud to offer customized boarding that is tailored to YOUR pup’s needs and comfort. As with daycare, your pooch gets to run freely as part of a specified pack (always with human supervision) and have a daily routine of fun to follow. Your pup can have some poolside fun during warm weather, then catch some rays while playing in the giant sandbox. 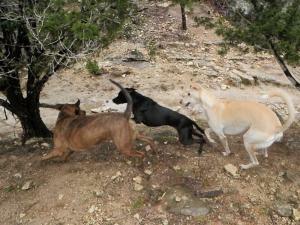 They can follow up with a wood chip pile romp or a relaxing stroll up and down the trails that run throughout The Ranch. At the end of their day, they are ready to hit the sack and dream of the new adventures that await them the next day. 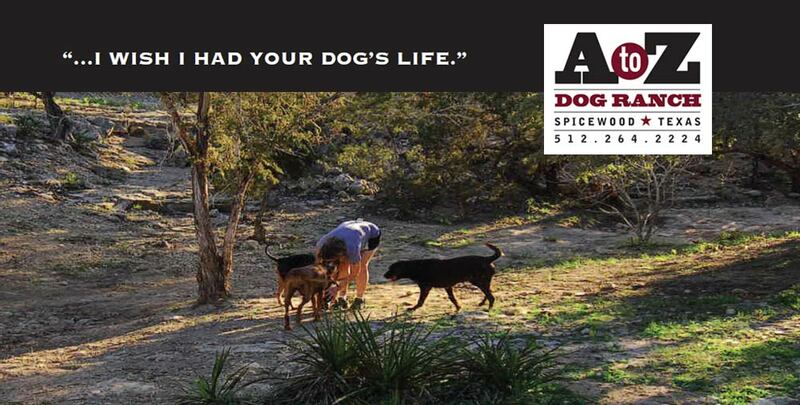 There is a little somethin’ for everydog here at The Ranch! All Business is by Appointment Only. In order for your pack to participate in the fun at the Dog Ranch you must schedule a Tour. Tours are $20 and take approximately 30 minutes. Dogs play outside, loose as a pack and are always supervised by at least one human in the yard. The dogs play in specfied playgroups. This allows periodic breaks during the day. There are also doggie pools to play in when it is hot and mountainous wood chip piles that the dogs love to climb year round. The Ranch has a total of 5 acres of play area providing your pups with lots of space to run and explore! Each play area is 2.5 acres with lots of shade and trails. Each of our play areas has improved, secure fencing. Please note, during major holidays/peak boarding times, daycare may be interrupted when we are full with boarders. Scheduled clients are notified via email when restrictions are applied. Full grooming services are available upon request and by appointment only. Estimates are provided prior to service being rendered and may vary according to the size of dog, coat type & condition. A special handling charge may be added for hard to manage dogs. Please check with our office for availability. Deshedding (30 minutes of brushing) – prices range from $30 to $80. If more brushing is needed, it is $15 for every additional 20 minutes. Payment is made at the time of pickup. Tips are welcome for our groomer. Check out on the final day is 10:30 am. After 10:30 am a $27 daycare fee is charged per dog. All Transport service times are to be scheduled with the Office no less than 48 business hours prior to the requested service. Transport services are only available Monday – Friday and are not available during Holidays/Peak Boarding times. All Transport requests must be submitted via email to [email protected]. All pickup and delivery fees are per pack. 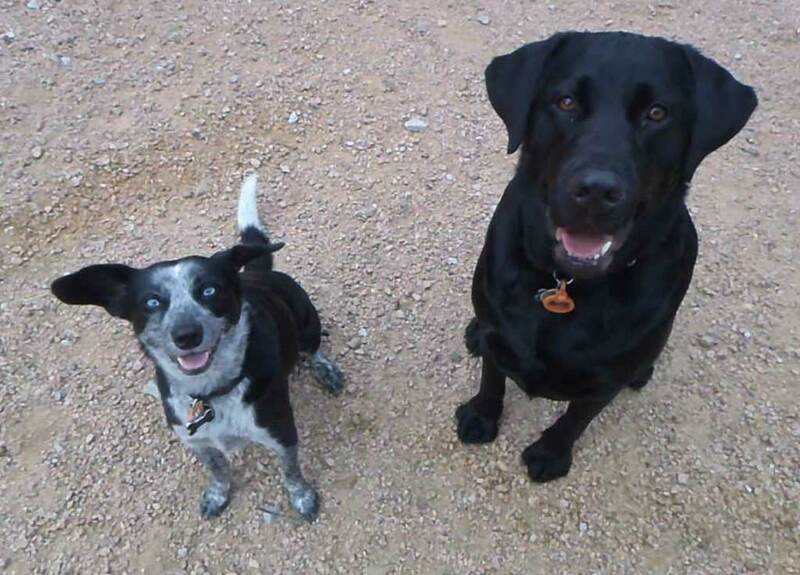 A Dog Park Day is a scheduled visit that gives you and your pup an opportunity to become acquainted with the Dog Ranch, meet the Ranch Hands and see firsthand why the Dog Ranch is such a special place. Each pre-scheduled dog park day is 30 minutes long and allows dogs to associate their human with the Dog Ranch since you will be present for their play time and they get to go home with you when their play date has concluded. All dogs must go through our tour & evaluation process before they can visit for a Dog Park Day. For regular clients, Dog Park Days give you a place to bring your dog where you know everyone has been screened and are up to date on their vaccinations. The holidays/peak boarding times are a busy at the Dog Ranch! We recommend scheduling any holiday/peak boarding reservations with us no less than four weeks prior to your requested holiday/peak boarding dates of stay. If we do not have an opening don’t fret – we do keep a waiting list. A to Z Dog Ranch does require prepayment in full for all holiday/peak boarding reservations. The prepayment amount is the total cost of the boarding reservation requested and is due at the time of scheduling. HOLIDAY/PEAK BOARDING PAYMENTS AND/OR DEPOSITS ARE NON-REFUNDABLE AND NON- TRANSFERABLE SHOULD YOU CANCEL YOUR RESERVATION. During peak boarding times (holidays, school vacations, etc.) we are unable to offer any refunds for early pickups. Additionally, clients are responsible for payment for the full length of the reserved stay once payment has been received and the dates of stay may not be modified before or during the stay. The following are the periods A to Z Dog Ranch refers to as Holiday/Peak Boarding Times for 2019 and 2020. Holiday/Peak Boarding Times for 2019 and 2020. Please contact our office if you have any questions regarding boarding during these periods. Ranch hours vary seasonally based on the amount of light that is available in the yard. Be sure to check our website for updates on hours of operation. Drop offs or pickups outside of our posted times are subject to a convenience charge of no less than $10 for daycare clients and $50 for boarding clients. Transportation Services – Prices vary based on distance from The Dog Ranch. All Pickup and Delivery service times are to be scheduled with the Office no less than 48 business hours prior to the requested service. Transportation services are only available Monday – Friday and is not available during Holidays/Peak Boarding times. All Transport requests must be submitted via email. Dog Park Days – The first visit for new clients is free. It is $15 for each additional visit. Meals – Dog Ranch does have a supply of assorted kibbles and wet foods available should a camper require a special meal for various reasons or ailments. We do charge per meal for these food items. Grooming – Prices vary on services requested. Please see our section on Dog Grooming for more information. Boarding Cancellations or Modifications – Reservations cancelled or modified within 24 hours of the scheduled arrival time are subject to a $25 fee. However, if your check in date is on a Saturday or Sunday, you must provide changes by 3:00 PM the Friday before your arrival date. Special Handling Fee – Starting at $10 per day. Circumstances that may require a special handling fee include but are not limited to: female dog going into heat, dogs that require their own playgroup due to problematic behavior, etc.